I had been somewhat procrastinating on my approach to Bogota. If I could have chosen a route that would easily bypass it I probably would have taken it. Virtually every person I met before my arrival decided to enlighten me about how dangerous the city is. It’s bad enough having to pass a normal city on a bicycle let alone one that sounded like a war zone (by the way people referred to). For some reason, I also imagined it’s sprawl would impact neighbouring towns up to 100 or km away. Towns that I’d have to pass before entering. As I guessed, these conceptions were wrong. None of the towns I passed through showed any sign of ‘danger’. And Bogota (where I’m writing this) has felt like a normal city. The greatest danger to a bicyclist is probably it’s heavy traffic but as a plus point there are a number of cycle paths and navigating is delightfully easy. The roads are all numbered so you also know roughly how far it is for any given address. I only have experience in part of the city (east side) and It undoubtedly has areas in which one would be unwise to go (particular in the south I’m told) but aren’t most cities like this? More thoughts on Bogota in a future post. 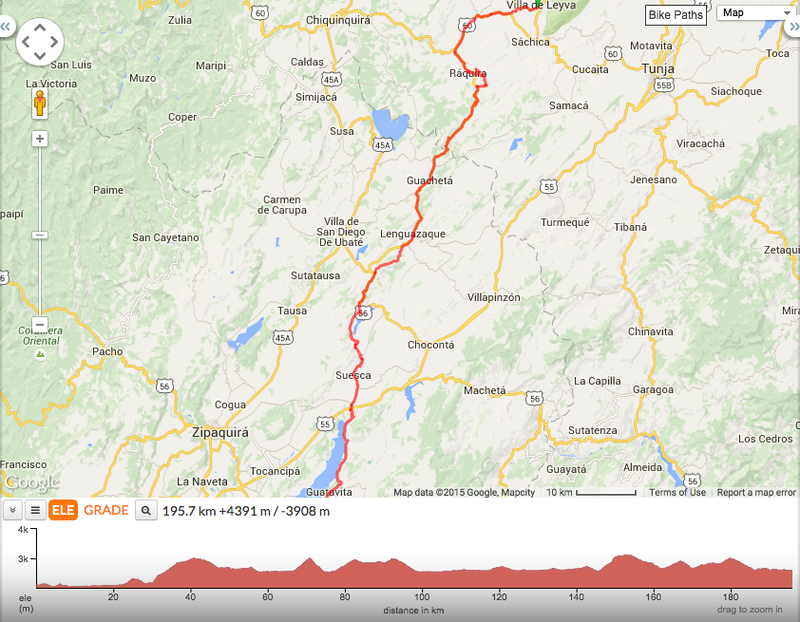 Anyway, I found the route from Villa de Leyva to Bogota to be full of awesome people. Interestingly in the less touristy mining towns of Guachetá and Lenguazaque, I found the locals to be the friendliest. All and all it felt like an excellent way to approach Bogota, virtually traffic free most of the way with pleasant landscapes. Accessing from La Calera gets you pretty close to central without too much stress. Javier and Luisa. 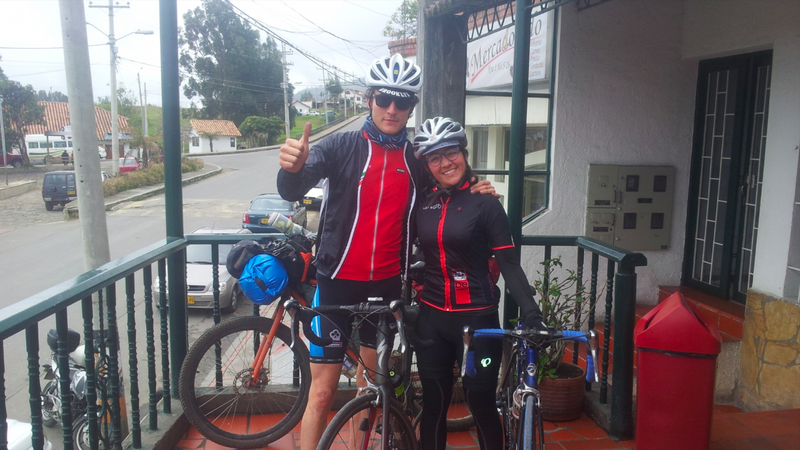 Some very cool Bogota people that I met whilst having breakfast in Guatavita. Javier took the opportunity to interview me for his radio show. ROUTE ANECDOTES: The ride up to Laguna de Guatavita was quite fun but involved going down and backtracking north 10 or 15 kilometres on the main road by the lake before climbing up again (about 350 metres change in altitude). On the way back to Guatavita, I tried to find a back route to avoid the highway but ended up too low too early and had to cycle half the road. On the way back, the junction you need to take is a four way crossroads about 5 minutes from the ticket booth entrance on the way down the hill. Take the first left past the small shop. Cycle up the hill and then you hit another four way junction. It is here where I believe you turn 90 degrees left to stay high (I made the mistake of going straight) and go past the house on the right that’s about 50 metres from the crossroads (worth asking). 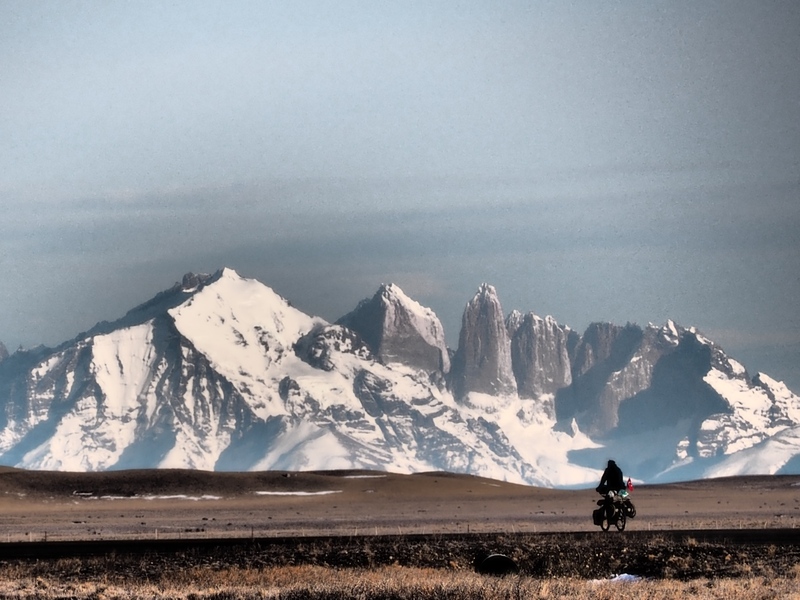 I think the road then continues to climb and stays high on the ridge which sounds quite cool to me. Almost certainly harder than the main road but maybe fun. I ended up going low too early; you could still make it all the way back to Guatavita if you ‘wiggle’ around but it turned into a slippery muddy footpath (which may be possible to cycle if dry) and I aborted and headed down to the highway. Laguna de Guatavita was somewhat interesting (a lake in a crater); it maybe more spectacular with the sun out.